trees | this is what I never expected to do. So I’ve been here over a year now. The things I expected/hoped to do and did: go to Tokyo, the Aquarium find parks in the city, get a new tattoo (though how I got it was unexpected and wonderful), Hiroshima, meet my relatives in Wakayama, go to Kyushu, climb a mountain, go to the Little Prince Museum, see a Hanshin Tigers game (baseball), go to some hot springs, keep writing poetry, learn some Japanese (always a work in progress). Things I didn’t expect to do and did: go to Hiroshima on World Peace Day, go to Hokkaido, go on a crazy two week journey backpacking through fourteen cities in Japan, meet so many amazing people, join an improv group, hold poetry readings in downtown Osaka (all I wanted was to go to some, but when I couldn’t find any…), work a second job (and one which involves working with young children! ), not only go to Kyushu but actually go to Nagasaki and Yakushima (more on this later! ), climb Mount Fuji (I wanted to climb a mountain, but I never had intentions for Fuji!). In a conversation last night with my friend Summer, we noted how one year feels like both longer than it was and much shorter than it was. After getting involved in things and meeting so many people and getting to know my way around Osaka (and other parts of Japan), I feel so comfortable here, as though it’s been longer. And, of course, with the way that time flies when you’re having fun and all that, it feels like it’sbeen a matter of mere months. When I think back to the first couple months, months, days, hours of being here alone, I’m amazed that I was able to do this at all. There’s not much you can do to prepare yourself for the shock of tearing yourself away from your friends and family who you’ve been surrounded by for your whole life, having never lived on your own, with hardly any knowledge of the language and culture you’re about to be immersed in, never having worked a full time job in your life (besides that one summer for a couple months, but we’re not counting that one…), being a picky eater, and not really that comfortable with change. I don’t know what to expect from here. I’m staying longer than I originally anticipated, and I have a life here that I never expected. I sort of like the not knowing. The word for the anniversary of your arrival in Japan: Japanniversary. 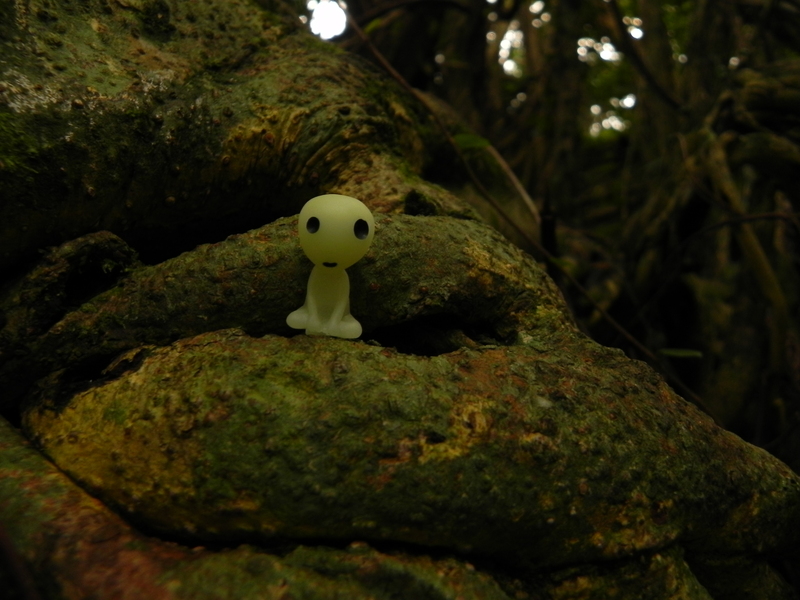 So I went to Yakushima. Last weekend, I spent a few days on this little island just south of a Kyushu, which is a larger island south of Honshu (which is the big, main island). It takes an hour and a half to reach by plane, and has an estimated population of around 13 500. The island is around 540 km2. Forty percent of the island is designated as a World Heritage Site. Towards the end of the trip, I commented to my friend that if he’d met a couple years ago, I would have never done many of the things I did on that trip. I wouldn’t have gone on a ten hour hike through snow and rain to see a giant tree, wouldn’t have eaten all the different fish that I did (especially the one in my soup with the giant fin still attached, or the raw fish with all the skin still on it..), wouldn’t have gone to the outdoor hot spring by the sea, wouldn’t have flown to some little island without booking any accommodations ahead of time. 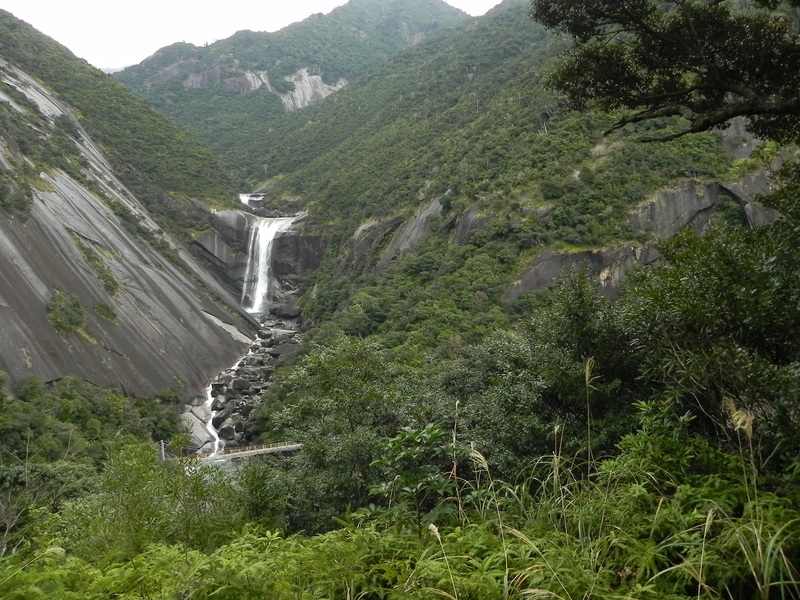 A large part of the appeal of Yakushima for me, at first,was that it’s the island on which Miyazaki (of Studio Ghibli) based the setting of Princess Mononoke. If you haven’t seen it, a large part of Mononoke takes place in this really old, lush forest. Even in the movie it’s breathtaking. I heard about it through my friend Ciaran sometime last year and I knew I had to go. The best time of year to go is definitely some time after February, but it was a convenient time for me to go. And anyway, if you go in the summer when the forest is probably the most green and lush, you have to deal with that many more tourists on the trails and at the accommodations, bugs (hornets, mosquitos, butterflies), poisonous snakes, and an assortment of other things. Even in the off season, even covered in snow, it was a beautiful hike. There was still so much green on the trees, which contrasted brilliantly with the snow. 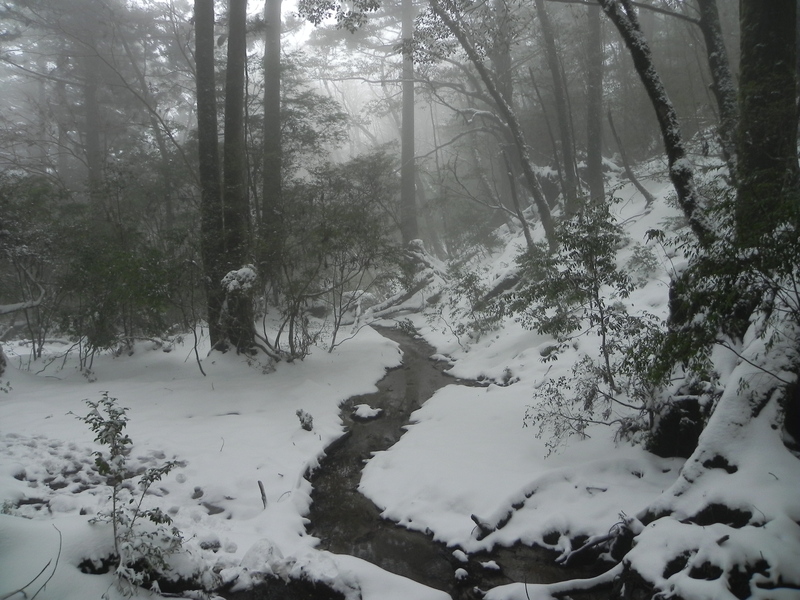 When we took a taxi up to the beginning of the path we started on (Shiratani Unsekyo), he warned us that we wouldn’t be able to do the path because of the snow, which only made us more determined. We were in the dark for at least the first hour of our hike, and not only did we do the entire path we wanted, but we did it in under the estimated time on the map. It led us through to the primeval forest that Mononoke was based off of, we saw deer, we saw amazing trees and tree stumps (many of the cedars on Yakushima were cut down many years ago for various uses). 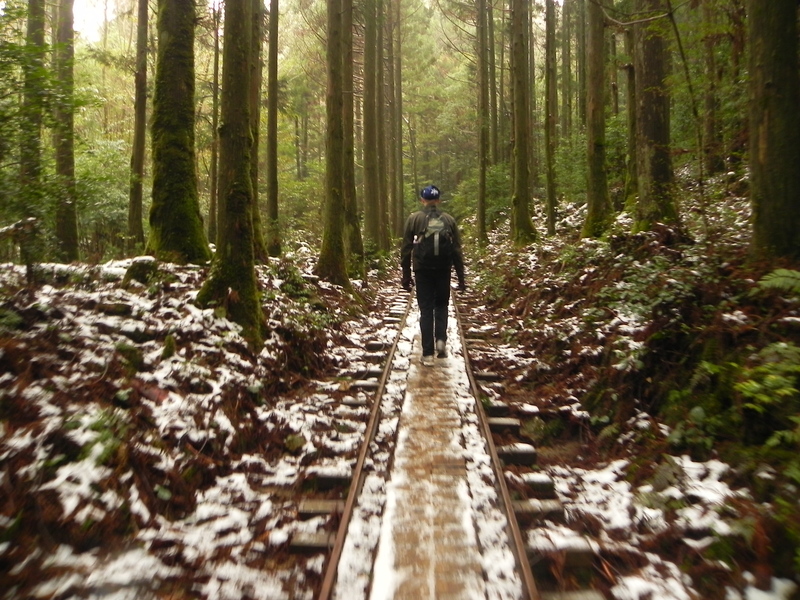 Then, after at least a couple hours of walking along an old train track surrounded by lovely tall trees, we followed another path to find Wilson’s Stump (a really large stump, more impressive than we expected!, and then later, Jomon Sugi, which is this old, huge tree that is pretty famous in Japan. It was incredible, but after soaking our feet and pants in the snow for seven hours at that point already, and with the rain, hunger, and fatigue, we didn’t stay around too long to admire it. Getting back into town was difficult as no busses were running where we were during the off season, we didn’t have any reception in the mountains at the end of the trail, there were no pay phones, and hardly anyone else was around. We were lucky to find a tour bus driver, waiting for a group of people, who drove us to an area with reception where he called a cab for us, and let us wait in the bus for it, since it was rather cold outside. The taxi driver was really nice too, and he gave us a mini tour as we headed into town. The second day was an adventure, too, though we didn’t do any more hiking. We wanted to see a few other attractions around the south part of the island, but after our experience trying to get into town the afternoon before, we were a little wary about how we would actual get around. Sure enough, after some exploring, we realized that we wouldn’t be able to take a bus. Taxis would be too expensive. Neither of us have a Japanese driver’s license. So we hitchhiked, both of us for the first time. We wrote out signs in kanji, with an added “onegaishimasu! !” in hiragana below (a way of being polite). We ended up getting rides from five people that day: a fisherman, a young man who drills for hot springs, a surgeon and his family (who lived in California for a while), a quiet man in a pick up truck, and a young woman who worked at a nearby hotel. The longest we had to wait was maybe fifteen or twenty minutes, the shortest was less than a minute. 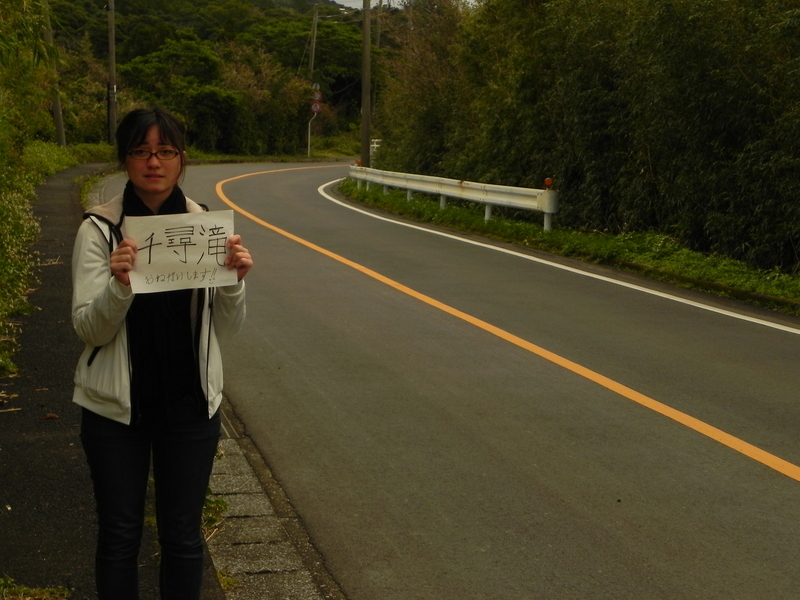 I have a feeling that Japan is one of the safer places in the world to hitchhike. I hear that it’s difficult for Japanese people to get rides in Japan, but that it’s relatively easy for foreigners. It helped that Tom can engage in Japanese conversation. A few times throughout the day, people looking at me and asking: “Nihonjin desu ka?”. And me: “Iie. Hafu desu. Kanadajin desu.” It gives me a small thrill. Day two started off with a free, outdoor onsen (hot spring) by the sea. It wasn’t as hot as it will be in a few months because of the cooler winter temperatures, but it was still warmer than the air and it was nice. Off in the distance, there were people fishing, but after being here long enough, you don’t care too much about these things. The next stop was lunch, which ended up being lunch meat and cheese slices on biscuits, yogurt and apples from the convenience store. After, a lovely waterfall (Senpiro no taki). 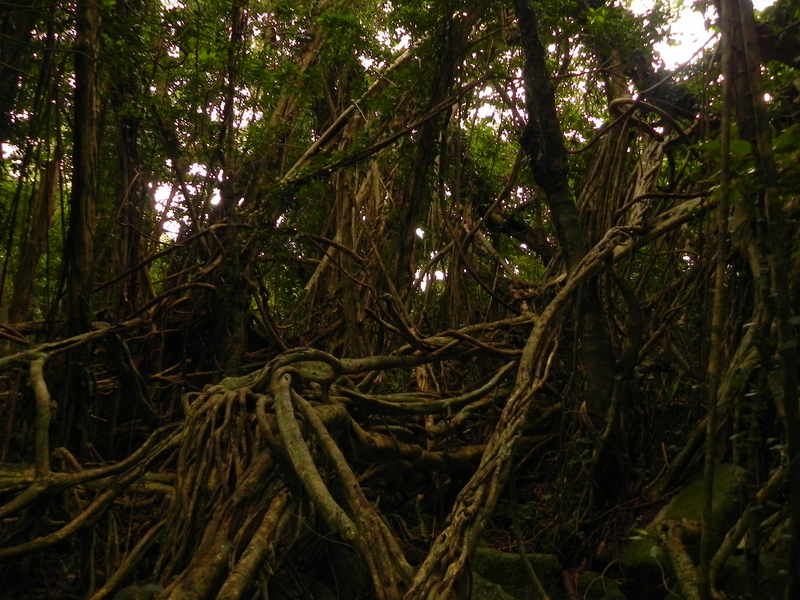 Then, a really cool banyan tree. I’d never seen a banyan tree, and didn’t really know what one was, but it was very cool. In the evening, we had an amazing dinner at a restaurant run by the same people who owned the lovely hostel we stayed at. We hung out with the cook there, and a few Japanese people who were also visiting the island. A note to anyone planning on going to Yakushima in the off season: it’s worth it because you get the place to yourself, basically. Busses, however, are uncommon. There are some, but not all of them run between October and March. Reception is hard to come by when your in the mountains, so plan ahead and if you want a taxi at the end of your hike, call one ahead of time (though there was a phone along the road back to the town, at some point). Despite how south it is, there is still plenty of snow on the mountains. 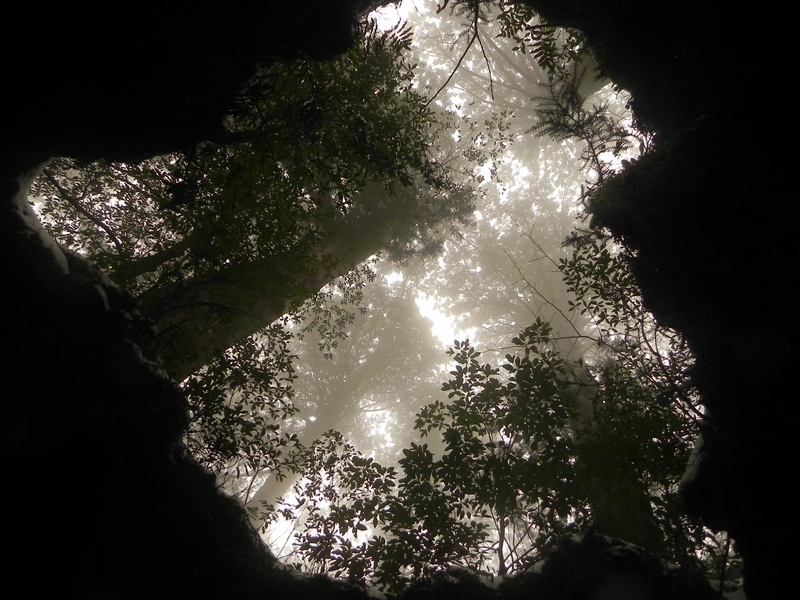 Yakushima also gets massive amounts of rain, so be prepared for that. It’s also wise to keep some small garbage bags with you, and maybe a roll of toilet paper just in case. You never know. 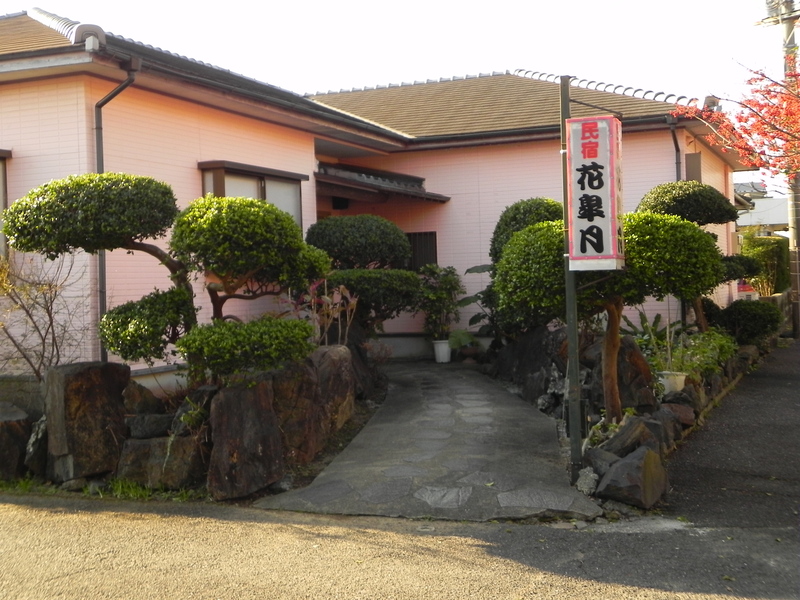 Lastly, we spent two nights in Anbo staying at a place called “Hanasatsuki”. They were incredibly welcoming and friendly; the food at their restaurant down the road was amazing and affordable (just ask for their recommendation and eat whatever they bring you); the tatami room we stayed in was comfortable and had a little TV and very effective air con. Life is good. I’m looking for a new apartment with one of my best friends here. I have my second improv show coming up next weekend. I have my fourth poetry event tonight. The plum blossoms are beginning to come out, which means that cherry blossom season will be here before we know it. As of Saturday the 7th, I have been here 100 days. Not that I’m counting. (But actually…). After three months of being here, I have only used up one stick of deodorant, leading me to believe that I probably have enough with me to last at least a couple years. Better safe than sorry. I am proud of myself for having been able to maintain a relatively clean and tidy apartment for the duration of my time here so far. I consider it an accomplishment (anyone who knows me really well – or at least my parents and brother and cat – can probably understand why). I’ve tried a variety of new food (but not too much. That would be uncharacteristic of me!). I’ve met a fair amount of people. I’ve been to a decent number of places so far. The most recent of which are Hiroshima and Miyajima, where I spent two days checking things out on my own. From what little I saw of it – which was basically just Peace Memorial Park and whatever it contains – Hiroshima seems like a nice city. It’s hard to believe sixty-six years ago, it was left unrecognizable by an atomic bomb. It was eerie seeing the A-Bomb Dome for the first time. It was the first thing I saw as I walked into the park after getting off the tram and it’s jarring. It’s unbelievable. It stands in stark contract to everything around it, but that’s the point (“…we shall not repeat the evil”). After spending a lot of time just staring at the Dome from different angles, I walked through part of the park, looking at different monuments. Most of the monuments are decorated with thousands and thousands and thousands of paper cranes. It’s amazing. Apparently after a chain of cranes has been hanging for so long, they are collected and recycled into notebooks and stationary (I might have bought a few notebooks!). The monument that I spent the longest standing in front of was the Children’s Peace Monument. When I was in grade 5, my class read about Sadako Sasaki in the story “Sadako and the Thousand Cranes”. I remember hearing about this monument, years ago. I never forgot the story. And for so long, that’s all it was – some story. Nearly fictional. Whenever people have seem me folding paper cranes in the past ten years, I’ve related the story to them, but often in reference to a book I read in grade 5 – not in reference to actual events in a real person’s life. And then there I was, this past Monday, standing in front of this memorial that people – that children – demanded be built in her memory and in the memory of all the children who died in the bombing. I left my chain of 1000 cranes, that I started folding in 2008 and finished this past Sunday, in one of the plastic-covered display cases, with a small note attached at one end. A couple hours later, I found myself standing in the museum, looking at paper cranes that were actually folded by Sadako Sasaki herself. Then after that, walking around again, I went back to where I had dropped off my cranes and they had been hung up. Looking at some other monuments along the way, I went to the Peace Memorial Museum. As it should be, it is a very stern looking building. It’s difficult to fully express the emotions I went through in the hours I spent in there because I had to partially forget them as soon as I experienced them because they were too negative, too conflicting, too upsetting. I mean, obviously the bombing was awful and had horrific after effects. We all know that. But the things I read in there, and the first-person accounts of people’s experiences immediately after the bombing and the long term effects, were a description of hell. I wouldn’t even want to recount to people some of the details I read in there. Once I was finished walking through the museum, I spent a couple more hours in the park before it got dark, checking out some other monuments. It’s a beautiful park. Beautiful and sad, but full of reminders of peace. I spent the next day on Miyajima, a sacred island which is home to Mt Misen (on which is a primeval forest which has been designated a World Heritage Site), Itsukushima Shrine, and the “floating” torii (said to be one of the three most scenic views in Japan). As I followed a climbing path up Mt Misen, I was in awe of how beautiful it was. Every time I see something beautiful in nature, I have this feeling like it is the most beautiful thing ever. I kept stopping and looking around, amazed. The sound of water, also close by, from streams running down the mountain. The sound of birds. So many trees. Beautiful trees. Away from all the tourists that were on the island. Fresh air. I took my sweet time getting to the top. Of course, this was largely because I’m not particularly fit and I needed to stop several times just to cool off, but also because I stopped a lot just to take in the view! Around five minutes away from the top, I found a nice big rock that looked out at the rest of the island and the other mountains in the area, and I climbed atop and just took it all in for awhile. It was wonderful. I did a bunch more on Miyajima, too… but Misen was my favorite. Miyajima seems to be known for it’s maple trees too. Rightfully so! Lovely maple trees. Tons of maple trees. Japanese maples? or are they called momiji? I don’t know. Whatever they are (they look like Japanese maples), they’re gorgeous. The way they catch the light. Their vibrant green. Their delicate leaves. I could go on about Miyajima, but you’d probably get bored. It was my first time travelling like that on my own. It was nice. I was able to do things at my own pace, and just have some time to be alone with my thoughts. It’s not how I’d always want to travel, but I think it was a good place to do it. My favorite thing about those two days was probably being around trees and close to water. Oh I miss trees and being close to water so badly. Knowing that Lake Ontario was only a five minute drive away. Seeing trees out my window. That was certainly the best thing, especially about being on Miyajima. Last week, when we were walking to our hotel in Shirahama, when we came across the beach by the Pacific, I immediately dropped my things and ran across the sand to the water I was so excited. There’s a lot more I could write about. My first time staying in a hostel (so-so; met a couple neat people). The awesome Hiroshima okonomiyaki (awesome). My first time on the Shinkansen (awesome). The depressing book of poetry I bought (not so awesome; interesting). Running into another English teacher from Osaka at the end of my day on Miyajima. 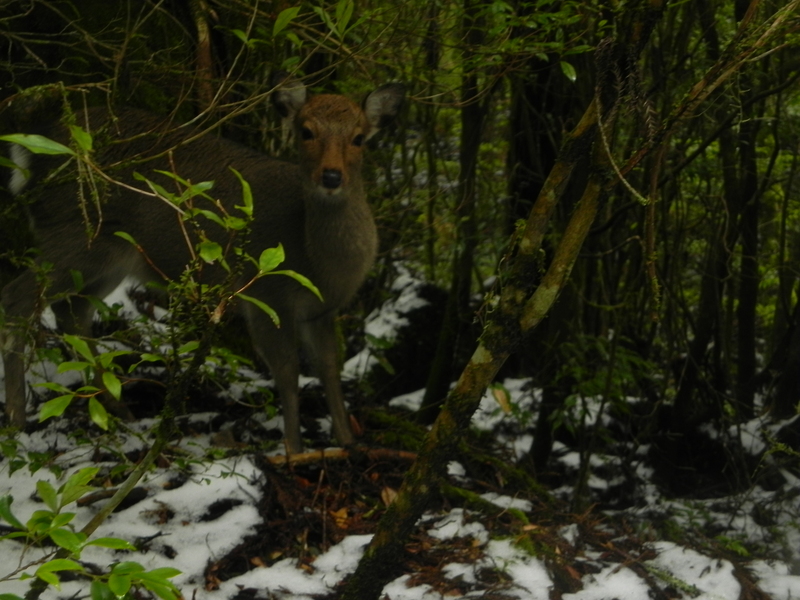 The deer on Miyajima (more approachable than the deer in Nara). Plenty more to write about. But I think the important stuff has been said. And really, isn’t this update already long enough? You are currently browsing entries tagged with trees at this is what I never expected to do. .